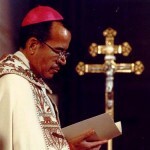 November 12, 2000 Eugene Antonio Marino, the first African American archbishop in the United States, died. Marino was born May 29, 1934 in Biloxi, Mississippi. He was ordained as a priest at St. Joseph’s Seminary in 1962 and in 1967 graduated from Fordham University. Following his graduation, he was spiritual director at St. Joseph’s Seminary from 1968 to 1971, when he became vicar general of the Josephites. From 1974 to 1988, Marino was the auxiliary bishop for Washington, D. C. and in 1985 he served as secretary of the National Conference of Catholic Bishops, the first African American to hold that position. On May 5, 1988, Marino was installed as the Archbishop of Atlanta, the first African American archbishop in the U. S.
August 20th in African American History – Eugene Thurman Upshaw, Jr.